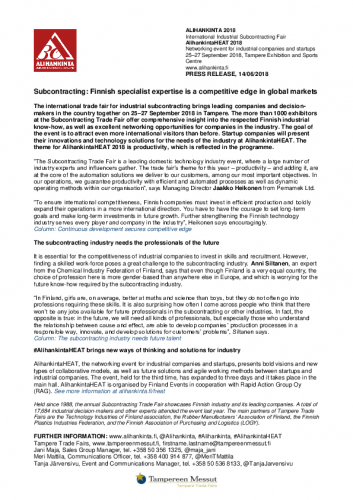 The international trade fair for industrial subcontracting brings leading companies and decision-makers in the country together on 25–27 September 2018 in Tampere. The more than 1000 exhibitors at the Subcontracting Trade Fair offer comprehensive insight into the respected Finnish industrial know-how, as well as excellent networking opportunities for companies in the industry. The goal of the event is to attract even more international visitors than before. Startup companies will present their innovations and technology solutions for the needs of the industry at AlihankintaHEAT. The theme for AlihankintaHEAT 2018 is productivity, which is reflected in the programme. “The Subcontracting Trade Fair is a leading domestic technology industry event, where a large number of industry experts and influencers gather. The trade fair’s theme for this year – productivity – and adding it, are at the core of the automation solutions we deliver to our customers, among our most important objectives. In our operations, we guarantee productivity with efficient and automated processes as well as dynamic operating methods within our organisation”, says Managing Director Jaakko Heikonen from Pemamek Ltd.
“To ensure international competitiveness, Finnish companies must invest in efficient production and boldly expand their operations in a more international direction. You have to have the courage to set long-term goals and make long-term investments in future growth. Further strengthening the Finnish technology industry serves every player and company in the industry”, Heikonen says encouragingly. It is essential for the competitiveness of industrial companies to invest in skills and recruitment. However, finding a skilled work-force poses a great challenge to the subcontracting industry. Anni Siltanen, an expert from the Chemical Industry Federation of Finland, says that even though Finland is a very equal country, the choice of profession here is more gender-based than anywhere else in Europe, and which is worrying for the future know-how required by the subcontracting industry. “In Finland, girls are, on average, better at maths and science than boys, but they do not often go into professions requiring these skills. It is also surprising how often I come across people who think that there won’t be any jobs available for future professionals in the subcontracting or other industries. In fact, the opposite is true: in the future, we will need all kinds of professionals, but especially those who understand the relationship between cause and effect, are able to develop companies’ production processes in a responsible way, innovate, and develop solutions for customers’ problems”, Siltanen says. 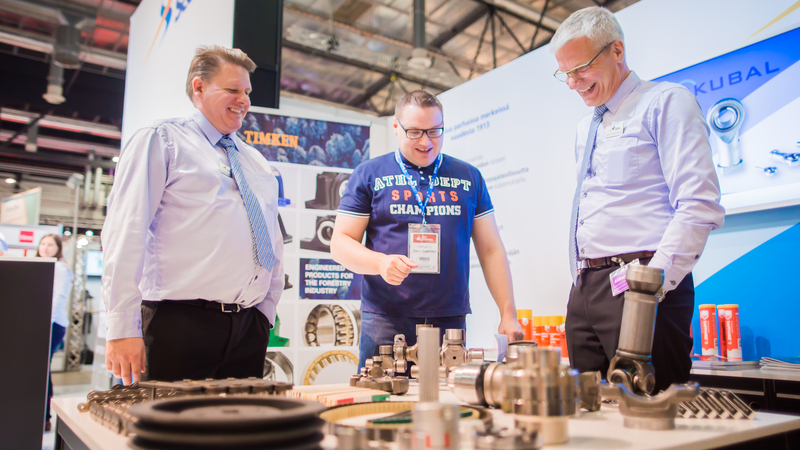 Held since 1988, the annual Subcontracting Trade Fair showcases Finnish industry and its leading companies. A total of 17,684 industrial decision-makers and other experts attended the event last year. The main partners of Tampere Trade Fairs are the Technology Industries of Finland association, the Rubber Manufacturers’ Association of Finland, the Finnish Plastics Industries Federation, and the Finnish Association of Purchasing and Logistics (LOGY).